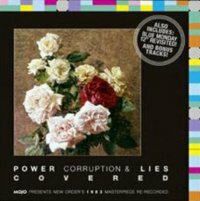 Recorded for Mojo magazine’s current New Order issue, this cover of the closing track on the classic Power, Corruption & Lies is yet another ode to the 80s from Destroyer’s Dan Bejar. Staying fairly faithful to the original, the track reverses the trademark New Order/Joy Division trick of playing the melody line with the bass, instead changing it to a reverb-dripped guitar, backed by deep synth bass. Anyone expecting the sound to be an extension of Destroyer’s sound on last year’s Kaputt(2011’s best album according to us) will be left disappointed, as there isn’t a saxophone or smooth female backing vocal in sight, but by staying close to the original’s sound Bejar avoids any potentially embarrassing misjudgements. As a result of playing it safe the track doesn’t quite make it onto the list of all-time great covers, but for a track that comes free with a magazine it’s hard to beat.